A thorough knowledge of carrier oils is important for many bodywork therapists, especially those working in the areas of therapeutic massage and / or aromatherapy. Carrier oils are also known as 'fixed oils' because they do not evaporate. This is in contrast to 'essential oils' which do evaporate, hence are commonly used in 'burners' that vaporise (not burn) such oils in order to dissipate their scent around a room or other environment. The emollient properties of carrier oils vary but in general this is one of their characteristics. Leave a permanent oily mark on paper because they are non-volatile, hence do not evaporate. Do not leave an oily mark on paper because they are volatile and so (given sufficient time) they evaporate into the air. However, colour present in the essential oil may stain paper. Generally miscible with chloroform, ether, and petroleum spirit. Miscible with carrier (fixed) oils. This property is used when aromatherapists blend a few drops of essential oils into a larger quantity of carrier oil. 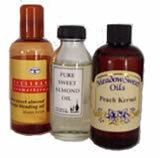 Carrier oils do not generally have disctinctive scents - it is their consistency and nutrients that vary. Essential oils are those used in aromatherapy. Note that aromatherapists blend essential oils with carrier oils before use/application. Note: Knowledge about selection of these oils and how to blend them in appropriate quantities with carrier oils is important. Specific essential oils have specific contraindications: Consult a qualified aromatherapist before use. Most are soluble in alcohol. Apricot oil is similar to Sweet Almond oil (see below) but is usually slightly more expensive. Its characteristics include a pale yellow colour, only slight viscosity, and it is very oily. "Persic Oil" is the name of the fixed (carrier) oil extracted from the kernels of apricots (as well as other similar fruits such as peaches, cherries and plums) by the process of cold expression. Moderately strong smell, similar to marzipan. Indigenous to China, now grown in many locations including the Middle-East, USA and France. Grapeseed oil is one of the most popular carrier oils used by bodywork therapists. It is a very fine oil that keeps moderately well and (when used as a massage medium) leaves skin with a smooth finish that is non-greasy. Virtually odourless; no distinctive smell. Grapevines are deciduous climbers, there are many different varieties. Grapeseed oil originated from France and is now produced in California, Italy, and Spain. Peach kernel oil is similar to apricot kernal oil and sweet almond oil, however it is usually slightly more expensive than sweet almond oil. The peach tree is a small deciduous tree of up to about 25 feet (8 m) height. It is indigenous to China, was brought to Europe by the Romans, and to the USA in the 17th Century. Sweet almond oil is one of the most popular carrier oils used by bodywork therapists. It has a pale yellow colour and is only slightly viscous (thick consistency), but very oily. Unrefined sweet almond oil has a delicate sweet smell. Indigenous to Middle-East, now also grown in the Mediterranean and South-Eastern USA. Wheatgerm oil is especially beneficial for tired muscles and so is an appropriate base oil for use for after-sports massage. Unrefined wheatgerm oil has a strong odour. A cereal grass indigenous to West Asia, now also grown in many locations across the world. A, B1, B2, B3, B6, E, F.
Wheatgerm oil is especially noted for its high vitamin E content. Cl, Co, Cu, Fe, K, Mg, Mn, Na, S, Si, Zn. Note: Anyone who is allergic to wheat flour should be tested for possible skin reaction before receiving a massage or aromatherapy treatment that includes the use of Wheatgerm carrier oil. Advice Notes: Some of the above oils may have contra-indications and some people may be allergic to them. Research side-effects of oils and do patch tests for skin sensitivity before use. The above revision notes are intended for therapists qualified in the use of carrier oils. Do all courses in bodywork therapies include training in the use of oils ? Not all bodywork therapists, or even all massage therapists, are trained in the selection and use of oils. For example, practitioners who have trained in Indian Head Massage but not in general Body Massage may not have studied oils because Indian Head Massage is often taught and practised as a dry treatment over clothes. In the same way, courses in acupressure and on-site massage do not necessarily include training about oils as these tend not to be used in treatments over-clothes or in open office, conference, or trade-show environments. Some reflexology courses include training about media such as oils, some don't. (Some reflexology courses require completion of a course in massage as an entry requirement).